Summary First wave 2 11ac 4x4 router with USB 2.0 & 3.0 drive and printer sharing and OpenVPN server. I decided to take my first pass at ASUS' summer sizzler before circling back for part two of the NETGEAR R8000 review. I figure I'll be comparing wireless performance of the two, so might as well do that in one article vs. two. This first installment will provide a general overview and cover wired routing and storage performance. The second part will cover wireless performance using the "Revision 8" wireless test process described last week. Part 2 will probably not cover how the AC87 handles Multi User MIMO (MU-MIMO). Although I am told that MU-MIMO is currently enabled in the router, there are no clients to test it with. ASUS says it will ship a MU-MIMO enabled client late this month (August 2014), but we'll see. Updated 8/7/14: ASUS clarified that MU-MIMO is "enabled in hardware", but not in firmware. It will be enabled when its EA-87 client-adapter / bridge ships. Latest information from ASUS is that the EA-87 "late August" availability is slipping. This review applies to both the RT-AC87R and RT-AC87U. Like ASUS' previous "R" models, the AC87R is functionally equivalent to its "U" sibling. The "R" is exclusive to Best Buy right now, with the "U" slated to become widely available by the end of this month. I'll refer to the product by AC87 in the review. Although the RT-AC87 is ASUS' shot across the NETGEAR's R8000's bow, the two products take very different approaches to attempting to provide higher total throughput for mixed classes of wireless devices. The difference between these two approaches was described in MU-MIMO vs. XStream: The Coming Battle For Wi-Fi Airtime. So please read that if you need a primer on MU-MIMO vs. Broadcom's XStream. The AC87 represents a few significant firsts. 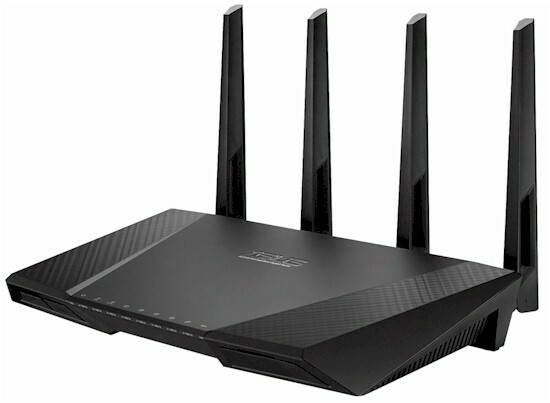 It is the first "wave 2" 802.11ac router available. While there is no official definition of "wave 2", it commonly connotes products supporting four spatial streams and MU-MIMO. The AC87 qualifies as "wave 2" due to its use of Quantenna's QSR1000 4x4 chipset announced last year. ASUS has over-optimistically classed the AC87 as "AC2400", so let's parse this out. Four-stream support is available in 5 GHz only, where the additional stream bumps the maximum link rate from the 1300 Mbps supported by AC1750 and AC1900 class routers to 1733 Mbps for 4x4 clients only. Three-stream and 256-QAM support in 2.4 GHz adds 600 Mbps, for a total of 2300 Mbps if you round down, 2350 Mbps rounding up. I don't know about you, but the rounding rules I learned don't let you blow right past the "5" point. So you'll find the AC87 classed as AC2350 in our Charts and other tools until the industry overrules us. The photo below comparing the AC87 and NETGEAR R8000 seems to make the AC87 look downright petite. But looks are deceiving. Although the AC87's body is only 6.5" deep vs. the R8000's 9", the AC87's antennas bring its total depth to a bit over 8"—only a 1" difference. Both routers are essentially the same width, so their footprints aren't that different after all. The AC87's seems to have much fewer cooling vents than the R8000. There are no vents on the router top cover, only on the bottom and sides. The topof the router is warm to the touch, even just idling. Note the two mounting slots at the bottom of the photo. This puts the back panel connectors toward the ceiling if you choose to wall-mount it. I don't much care for the soft blue LED placement and the front panel's undercut styling. Unless the router is sitting above you, you'll find yourself picking it up to clearly see the lights or operate the LED and Wi-Fi on/off switches. The two switches have a delayed effect, so I found a press-and-hold strategy worked best. But you may still find that repeated presses are needed for the desired result. At least the LED's don't burn with the intensity usually found with blue LEDs. To hit the tiny Wi-Fi Protected Setup (WPS) switch, you'll need to reach around and feel for it on the back panel. All Ethernet ports are Gigabit, of course, and you get a USB 2.0 port on the back and the awkwardly placed and easy-to-miss USB 3.0 port on the front under a tethered-rubber flap. Not the most elegant or user-friendly design and early users are (rightfully) squawkin' about it.